you can click on the link here: Music Box filled with flowers. I must say that I have made 3 arrangements this week so far. as I start to get more serious with packing! I still need flowers around me, but time is pretty tight around here lately. So simple is good! . 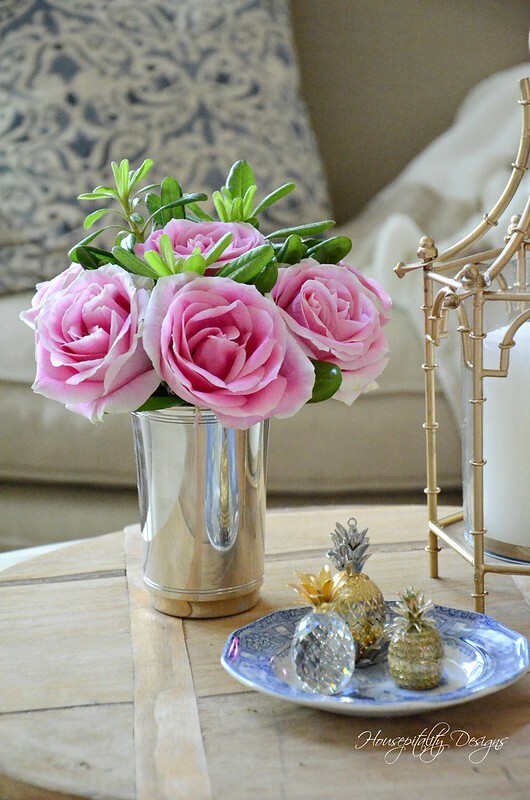 . . Like this simple silver Mint Julep cup filled with pink roses. Another arrangement I created was for a post that will go live on Friday. 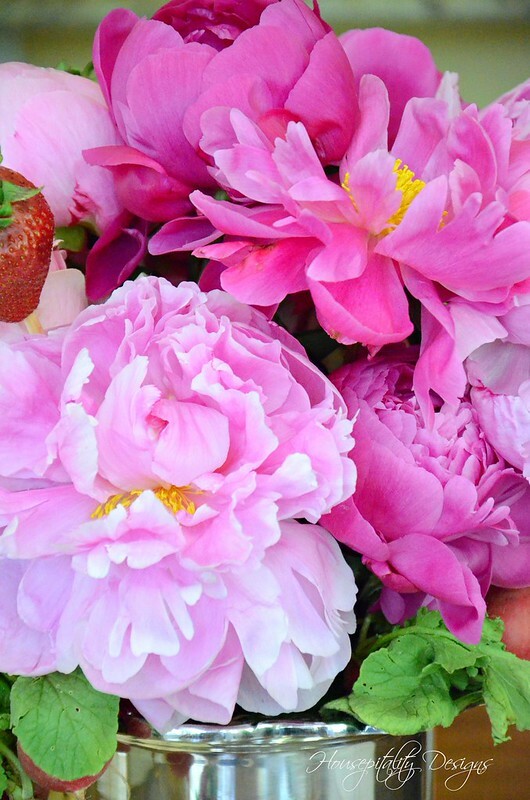 Can you see what is beyond the flowers? A tree?!!! . . . yes a tree in the sunroom. 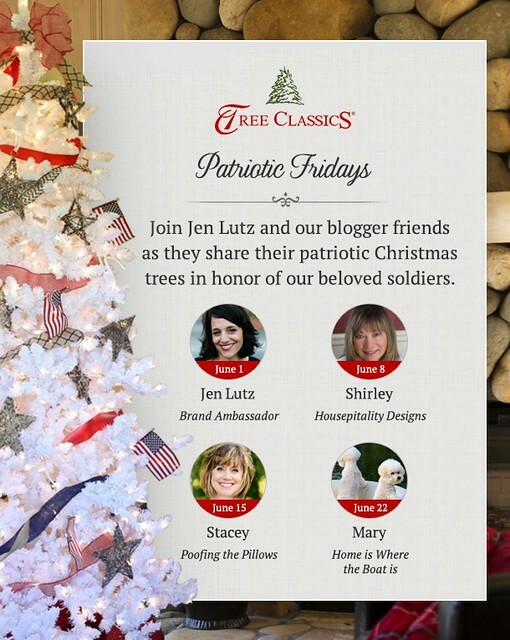 I am joining 3 fellow bloggers in a Patriotic Tree Campaign sponsored by Tree Classics. 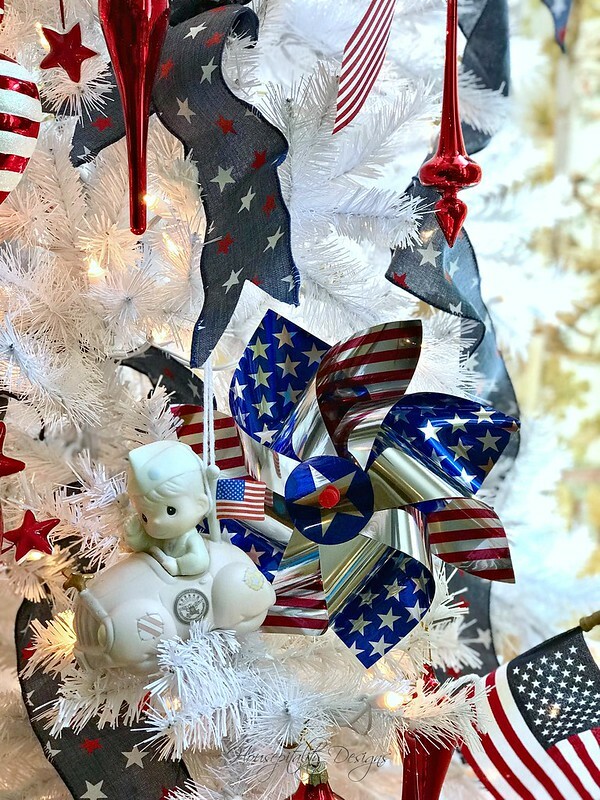 Our patriotic themed-inspired white Christmas trees are a tribute to people in service. In addition to this fun and most inspired blog hop, there will be a Giveaway. Tree Classics will give away a (to be announced) beautiful white Christmas tree to one lucky winner! I will give you details tomorrow. So stay tuned tomorrow as I present my Pretty Patriotic Themed Tree. I love what I’m seeing already! I think you are doing amazingly well with all you have going on. Will be watching for both. Let us see your new house plan when you make a decision. All I can say is “WOW!” You are amazing with all that you have going on…….I think that the Energizer Bunny comes to mind! I absolutely love your house and everything that you have done on the inside as well as the outside. Very familiar with your area since I grew up in Burlington,NC but now living in Murrells Inlet, SC on the coast. My daughter lives in Pinehurst, NC and is definitely planning on visiting your favorite consignment shop!! 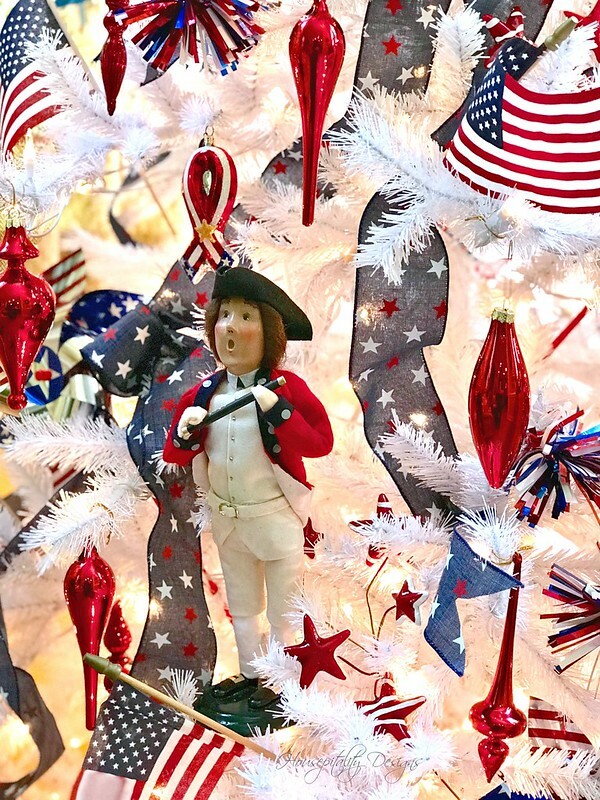 Love, Love, Love the tree with the patriotic theme! Gorgeous! Shirley, I can’t get over how much energy you have! You are an inspiration! Everything you have shown looks beautiful, and I can’t wait to see your Patriotic Tree! Everything is always so beautiful! 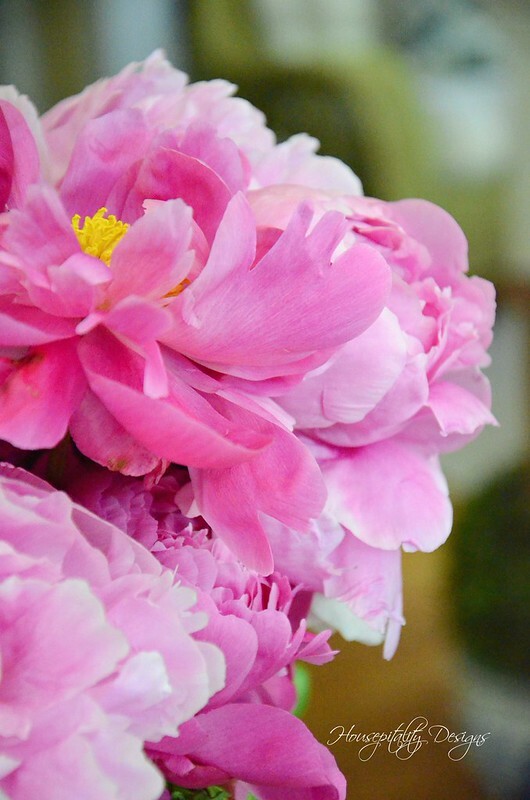 Love the flowers, especially the peonies! I am liking your patriotic tree too. Looking forward to more! Shirley you are the best. I love your style girl. This tree is amazing. 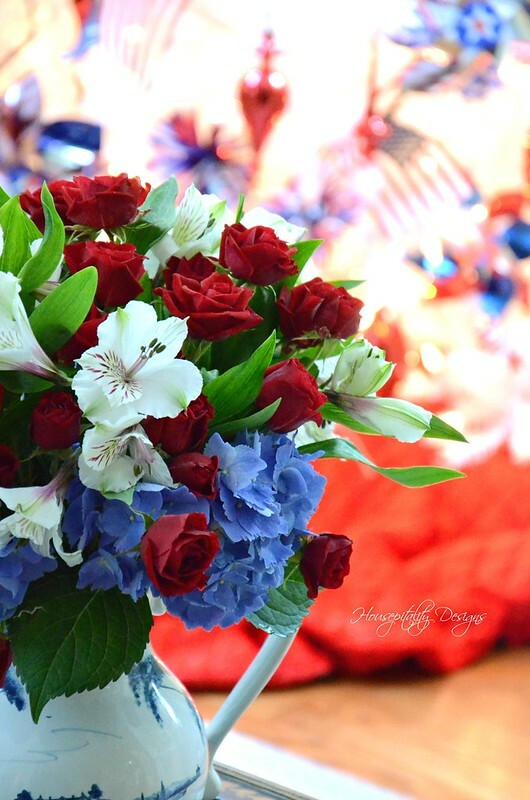 How fun to have a red white and blue tree. Our patriotic trees are almost identical! I have the Byers and also the Fife and Drum Corp pieces from Williamsburg Marketplace as the central pieces. Can’t wait to see your post with the complete picture! Shirley, your rose filled mint julep cup is gorgeous! I can’t wait to see you patriotic tree! I agree with everyone, you have tons of energy!